On April 3rd, 2018, a woman from San Diego showed up at the physical office of YouTube in San Bruno and began opening fire at employees. Four people were injured before she allegedly turned the weapon on herself and took her own life. The fact that this was a female shooter was startling enough. Shooting people up is usually a male-loser-only thing. But then came the supposed reason: the 39-year-old female shooter was supposedly furious at YouTube for demonetizing her stream and censoring her videos. All of a sudden, people are rallying around YouTube. They’re the new Parkland victims. They’re the new Vegas Strip victims. They’re the new insert-the-next-gun-tragedy-here victims. 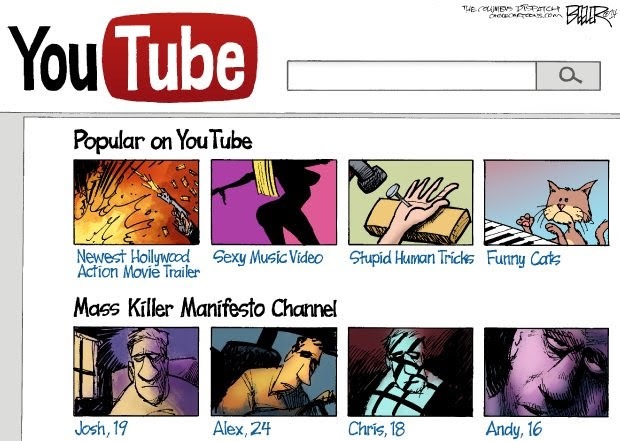 Here’s the problem: when you think YouTube, you think of the people who make the videos. You think of the content creators. The personalities. Not the overbearing “Too Big To Fail” corporation that manages the videos, that are in charge of monetization, that shove commercials in, that decide what should and should not be “allowed” on YouTube. The 39-year-old female shooter was one of the personalities. The campus and the people shot up were part of the corporation. Now I know some people will not like what I have to say about this, and before I do, let me make it clear that what this female shooter did was wrong and should be condemned at all levels. The people she attacked, in all likelihood, did nothing to wrong her personally. They were and remain innocent victims in all of this. However, the shooter’s actions were not done randomly or without what she deemed to be cause. She struck out at the company that she believed had wronged her and had wronged her in a way that is too common for people who do business online. From the very beginning, YouTube, even before it was bought out by Google’s parent company Alphabet, created an environment that encouraged people to become media personalities. It didn’t matter if they were wild, zany, crazy, or completely off their rocker as long as it brought viewers in. They encouraged crazy antics and then they monetized those personalities, turning a lot of them into stars in their own right. Let’s put it this way: if not for YouTube, Justin Bieber would still be slumming around in Canada as a nobody. YouTube gave the world Justin Bieber. Think about that. YouTube created all sorts of stars and then paid them obscenely well. One personality gets over a million dollars per month. Or he did until he filmed a suicide and tazered some dead rats and pretty much revealed himself to be a complete douchebag. But still... a million dollars. Per. Month. Again, think about that. Granted only a few of these personalities have garnered that much success, but it’s still enough to encourage a whole lot of others to jump in and try to be the next Logan Paul or the next Amanda Cerny or the next Chris Crocker or the next PewDiePie. And, full disclaimer, this commentator is also a YouTube creator. I created promotional videos for my comic series, I created an online video comic, I created a crazy series of videos based on quick rants for the now-defunct Shocknet Radio, and I did a three-part series on freedom, which I believe is my best work to date. But I didn’t try to monetize my works, nor did I think that I could make my living doing YouTube antics. But others do believe it, which is why I can’t consider YouTube and parent corporation Alphabet completely blameless in this tragedy. Because YouTube and Alphabet dangled a golden carrot in front of all these people, encouraging them to be wild and crazy and zany, to be popular, to get viewers, and then reward the most appealing personalities with advertising money. They offered these folks a way to make a living, never mind a way to become a celebrity. And now that YouTube is fat and rich and the premiere online streaming service, they’ve been doing the one thing that no corporation should ever do... and that is to mess with the money of their content creators. It’s no secret that YouTube has been messing with the algorithms, changing the way that the revenue is generated, which directly affects the bottom of line of those who have been trying to be the next YouTube celebrity. Quite recently, YouTube administrators out-and-out admitted that not all subscribers to YouTube channels were notified when new content was available. Only the ones that YouTube’s algorithm deemed “most likely” to watch the videos were notified. Again, that affects the bottom line of those who make their money off how many people view those videos. Many of those content creators were pissed off at this, because this did affect their income. Now if I was one of those people trying to make a living doing YouTube videos, I would feel angry and betrayed as well. I would want something done about it. I would want YouTube and Alphabet executives to understand that you’re messing with the livelihood of the very creators that helped YouTube get fat and rich. And I would want them to knock the crap off. I would not go to the extents of the unnamed female shooter, but, then again, I was not encouraged to be wild, crazy, and zany for a paycheck. Again, I strongly condemn what this unnamed female shooter did to the YouTube campus and its employees, but let’s get brutally honest here… this really was a crisis of YouTube’s creation through their shoddy corporate treatment of the very talent they were cultivating and encouraging. Just like any other corporation, you cannot play money games with the very resources that you need and expect them to simply “take it”, especially when you foster an environment that encourages unstable personalities. This is no different than the sensationalism exhibited in the newspapers and television in previous decades. They made their money off the unstable, the crazy, the zany, the weird personalities. Hell, Jerry Springer still does it. But at some point they learned the hard way that they were playing with fire when they did. And some folks did get burned over it. Now it’s the online world’s turn. YouTube and Alphabet executives need to get it through their thick, greedy, profit-obsessed skulls that they are messing with the lives of people when they mess with the money they earn for the content those people created. Stop treating them as product. You did not create the content that made YouTube successful. *They* did. You would not exist without them. You would be a failed entity without their contributions. Accept that and stop screwing them over. You will be doing yourselves and your employees a favor when you do that.